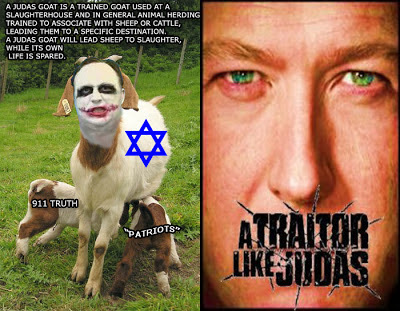 Alex Jones, the most influential and well-known man in the conspiracy community, has now been exposed by dozens of reliable colleagues in the truth movement as being a Judas Goat. 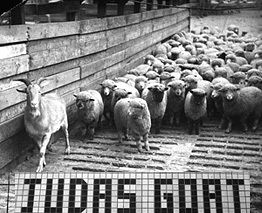 A Judas Goat is a trained goat used at slaughterhouses, a good-looking alpha-male type who they send in to associate with the sheep/cattle then lead them aloof onto trucks and into slaughterhouses, while its own life is spared. The list of people Alex has lied to, short-changed, betrayed, or double-crossed in the truth movement has continued to grow to the point that it is glaringly obvious just who/what Alex Judas Goat Jones is. Bill Cooper exposed Alex Jones as a "bold-faced cowardly liar" on his radio show and was shortly thereafter shot dead at his home by government agents. Jack Blood, a former employee, exposed (among several other things) how he was forced to tote the "official infowars position" and how Alex doesn't even sign his own "autographed videos." Fellow Austinite Shelly Tumbleson exposed how Alex has repeatedly lied about the infamous "Parking Lot Incident" where he was supposedly attacked by 4 government agents. Mark Dice, a long-time supporter of Alex, has now come out against him and exposed how Alex's Tangy Tangerine product contains arsenic, lead, mercury and other poisons. US Army veteran Gregory Pitchford and celebrity Tila Tequila were both recently lied to and betrayed by Alex Jones. Leonard Horowitz and Sherry Kane have exposed Alex on several occasions linking him with Cointel Pro controlled opposition. Eric Phelps, Craig Oxley and Thomas Richards have thoroughly exposed Alex Jones' gate-keeping of the Vatican/Jesuit issue. Mike Delaney of ProThink.org and ZionCrimeFactory.com has thoroughly exposed Alex Jones' funding by, marriage to, and gate-keeping of Zionists. Even though Alex is the self-proclaimed grandfather of the 911 truth movement, he won't have Dr. Judy Wood on his show or even mention her name, instead degrading her with the moniker "Marvin the Martian." Fellow Austinite Catherine Bleish had her 2nd Ammendment Rally completely co-opted and ruined by Alex. I have also personally been snubbed by Alex Jones after exposing the Moon Landing Hoax, and the list just keeps growing. Now just today fellow radio hosts Vinny Eastwood and Pete Santilli have come out with this excellent interview exposing what they know of Alex Judas Jones. Please watch these videos, check out some of the links above, and leave a comment what you think. Guruji said,"Good on ya' Eric." After I read your posting. If you want to investigate anything, just follow the money. This is not easy. There are lots of fences and walls and buffer zones between the top and the payee. Even more astounding is government is one such buffer zone. Add a very in depth investigative researcher, Josh Reeves, to the list of those outing Mr. Jones as a member of the John Birch Society, founded by the Jesuits. Another excellent expose of the Jesuit/Rothschild connection is by William Dean A. Garner. Great interview on Red Ice Radio. Who can you trust these days? your own lying eyes?